Cesare Siepi, who fled Fascist Italy and later rose to fame both as a staple of the Metropolitan Opera and one of the most celebrated singers to play the title role in Don Giovanni, has died at age 87. Siepi, a native of Milan, Italy, died at Piedmont Hospital in Atlanta on Monday after suffering a stroke more than a week earlier, his family said Tuesday. 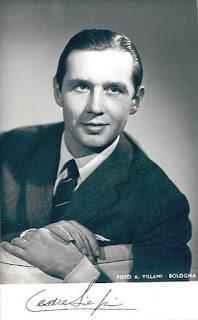 Warm, deep, resonant and melting, Mr. Siepi's voice was a defining sound in opera in the 1950s and 1960s on the world's stages and, fortunately, in many recordings. For years, he was the reigning bass at the Metropolitan Opera, and a regular fixture at London's Covent Garden and many other houses around the world, singing virtually all the staple roles of the bass repertory: King Philip II in Verdi's Don Carlo, Boris in Mussorgsky's Boris Godunov, and, perhaps most memorably, the title role of Mozart's Don Giovanni. Tall and handsome, he was one of the few Giovannis who could both sing with the sensuous, seductive ease the role requires and look the part of the irresistible seducer. He owned the role for decades, even making a film of the opera, released in 1955, under celebrated German conductor and composer Wilhelm Furtwängler. Siepi made his MET debut in November of 1950 as King Philip II in Verdi's Don Carlo. It was opening night of the 1950 season which was not only Telecast, but also happened to be first performance under Rudolf Bing's management. The Grand Inquisitor that night was Jerome Hines, Jussi Björling was Don Carlo and Robert Merrill was Rodrigo. What a cast of singers! While Mr. Siepi was celebrated around the world, the Met remained a home of sorts; he continued singing at the house until 1973, in more than 400 performances. "Siepi stopped the show every time he finished an aria, for his portrayal . . . was a human experience. His singing, always a joy, has rarely surpassed the heights of richness and eloquence it reached last night." Bravo, Maestro Siepi. You will be missed!